In the late 1960s, the Lamborghini Miura was considered the car of the rich and famous with lead feet. Even today, Lamborghinis adorn the garages of many famous car collectors, and wealthy race car enthusiasts love Lamborghinis. 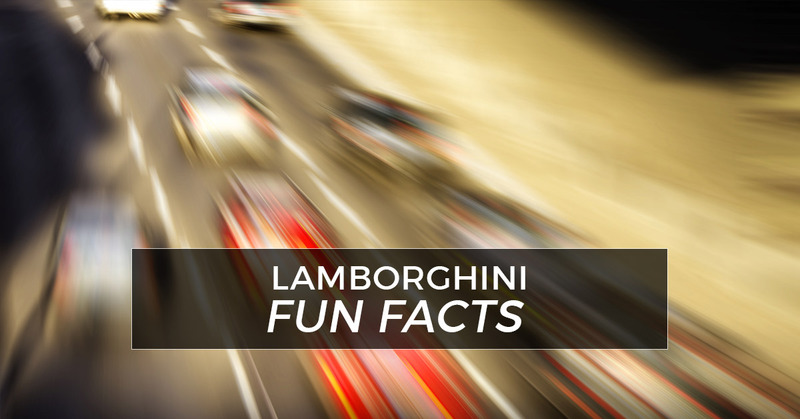 Today, we’re focusing on some fun facts about Lamborghinis. Lamborghinis were developed by Ferruccio Lamborghini, who started out as a vehicle maintenance supervisor for the Italian Air Force during World War II. Quickly developing a reputation as a mechanical mastermind, Lamborghini began manufacturing tractors, which people loved. Yes, Lamborghini cars were developed after Enzo Ferrari insulted Feruccio at the Ferrari headquarters. Feruccio himself owned a Ferrari, and he visited the Ferrari headquarters to request a different clutch for his car, which was the same clutch used on his tractors. According to witnesses, Ferrari responded by calling Lamborghini a “silly tractor manufacturer,” which angered Lamborghini enough to start his own line of race cars. When the first Lamborghini, the 350 GTV, was revealed at the Turin Auto Show in the early 1960s, it was not yet finished and included a pile of bricks underneath the hood where the engine would have been located. However, Lamborghini representatives simply kept the hood shut and eventually competed building the entire car, engine and all. Leonardo diagnostic tools are designed to work with high-end Italian luxury race cars, including Lamborghinis. Contact us today to learn more about our diagnostic software for cars!